You certainly couldn't complain about the beautiful setting at Henlow! After breakfast every morning, us girls went on a walk around the grounds, exploring the beautiful gardens, which were in full bloom. Another big plus for the resort was that in addition to the pool area, there was a large conservatory with big sofas to relax on. That way, if you didn't fancy sitting by the swimming pool all day, you had another place outside of your room to enjoy. 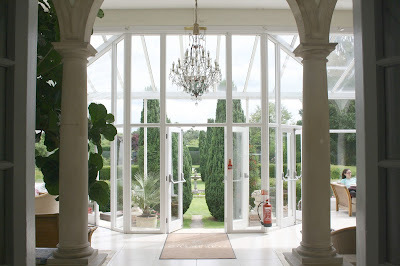 We spent a lot of time in the conservatory during our stay! 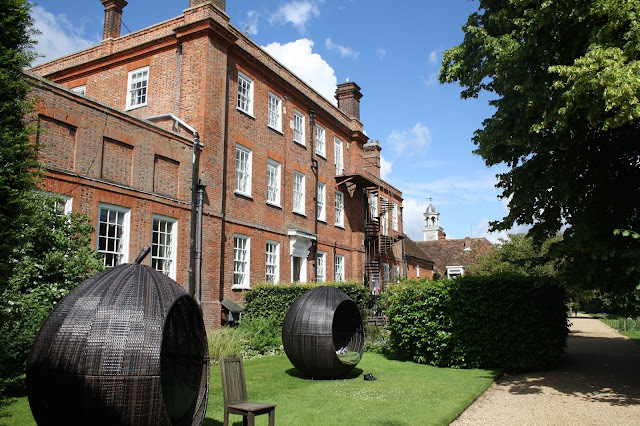 You could also choose to recline in one of these secluded wicker pods! The rooms also left nothing to be desired. 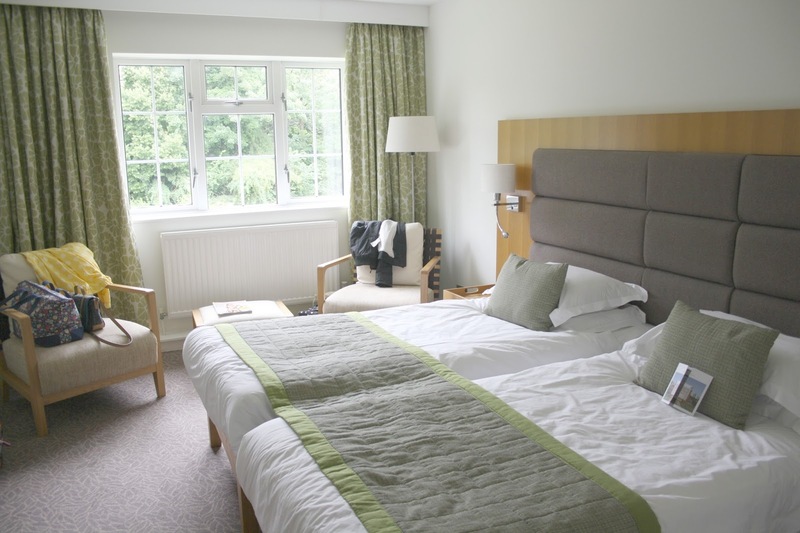 Our bedroom was spacious, perfectly clean, and very well equipped. 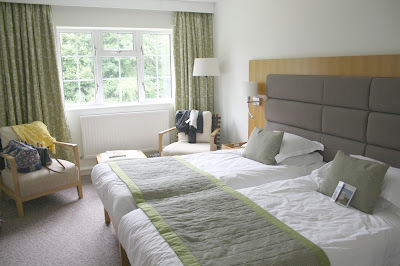 I shared the ensuite twin room pictured to the right with my sister. 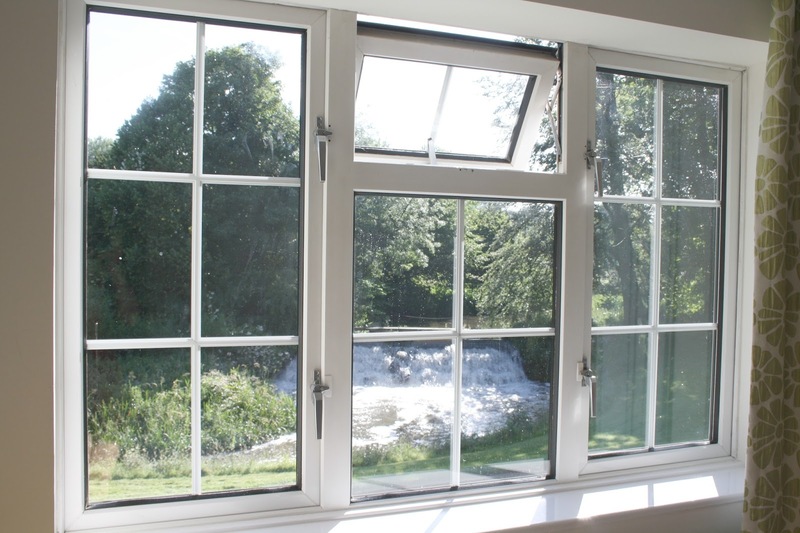 We were very lucky to have a first floor too, overlooking a view of the weir. In our rooms we found our spa robes and flip-flops, all ready to go! 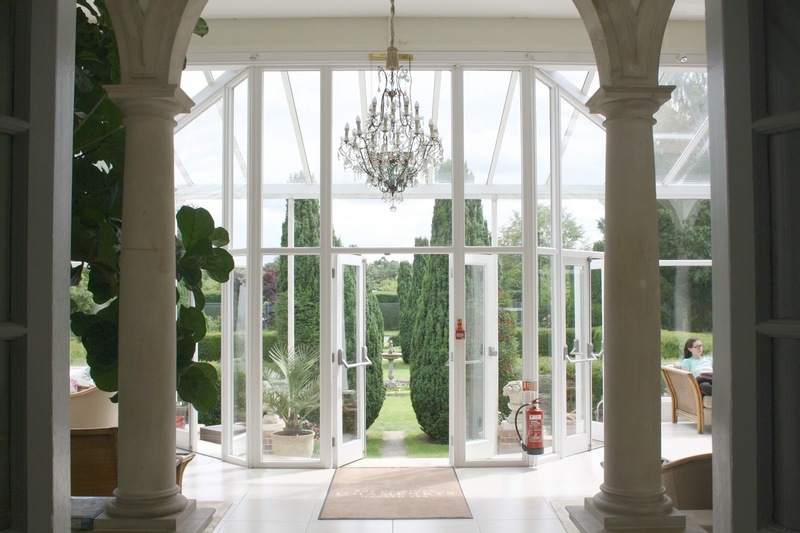 At Champneys, you can wander around in your big, fluffy, white robe all day, which is very comfortable and contributes to the relaxed feel. The atmosphere of the whole place was so chilled - perfect for ultimate relaxation. We booked in for three spa treatments each during our stay. The first was thalassotherapy. The word thalassa in Greek means 'the sea', so this treatment involved getting into a warm, mineral-rich saltwater pool, and using hydrotherapy jets to massage and stimulate your muscles. The minerals infused in the water, including copper, magnesium, and zinc, promote the body's natural detoxing processes. Each person in the pool rotated around the various hydrotherapy jets, which massaged everything from the soles of the feet, to your shoulders. You came out feeling like you'd been to a masseuse! My next treatment was a hot stone massage. This was absolutely heavenly! I was apprehensive about the heat from the stones to start off with, but the warmth actually turned out to be really pleasant! The hot stones aren't just placed on your back and left there, the therapist holds them in their hands and actually uses them to massage your back. This felt totally blissful, and really managed to work out the knots in my shoulders. I'd recommend this treatment to anyone! Finally, I enjoyed an Indian head massage. I enjoyed this treatment the most! The 45 minute therapy included an upper back and shoulder massage, as well as the head massage. My specialist's name was Isabella and she was absolutely wonderful - her relaxed and friendly demeanor really put you at ease. I felt like my head was in the clouds when I left, it was wonderful! 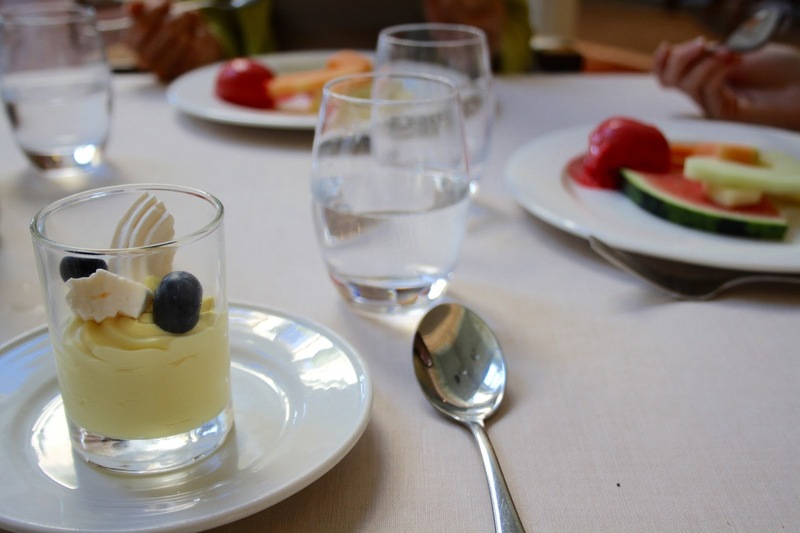 A word definitely has to be said about the amazing food at Champneys! As part of our package, we had three meals a day included. My breakfast highlights included the juice shots, which consisted of beetroot, brocolli, cucumber, and apple juice. At lunch there was a hot and cold buffet with choices galore! As all of the food was locally sourced, freshly cooked, and very health conscious, you could eat as much as you like, guilt-free! We had a three-course dinner every night, with my favourite dishes including a roasted Mediterranean vegetable salad, and grilled chicken served with chorizo and olive risotto. All of the meals were very light and didn't leave you feeling bloated. 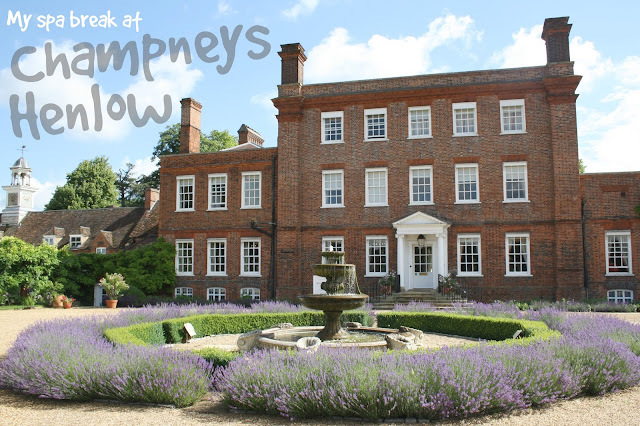 I couldn't resist trying out some of Champneys' gym classes, as the vast majority are free for resort guests. I had a go at my first ever Hula Hoop fitness session and I had a really good time! Trying to keep the hoop spinning was a challenge but lot of fun, so I didn't even feel like I was exercising! It was a good workout though, my sides ached the next day from the weighted hoop. I also attended a Stretch and Relax class, which provided a great opportunity to chill out and stretch out those tense muscles that you didn't know you had! My Mum and I paid a supplement to attend an hour's meditation class, which was well worth it. The instructor explained the basics of meditation and mindfulness to us, and gave us some really helpful tips to take away. I'll definitely be using some at home! Have you ever been on a spa break? Share your experiences in the comments!